Brainstorming – a staple of collaboration and teamwork. But is brainstorming really the best way to come up with new ideas and creative solutions to difficult problems? Some studies say no. These studies claim that “group creativity may be an overestimated method to generate ideas and individual brainstorming exercises (such as written creativity drills) may be more effective”. Teams use brainstorming with the goal to come up with creative ideas and increase productivity. However, brainstorming often does not yield the desired results. Done wrong, brainstorming can even decrease the creative output of teams. One big problem of brainstorming is that it favors ideas that come up first. The first ideas often serve as a guiding point and participants are (often unconsciously) influenced by it. This can lead to so-called “groupthink”, which means that participants feel pressured to conform to, what they perceive as, the majority’s opinion. While this might lead to a consensus, the chosen idea or solution might not be the best one, only the “loudest” one. In most brainstorming sessions, a few individuals dominate the discussion. And even if there is a moderator who tries to include everyone in the discussion, the quieter group members will often be hesitant to speak their mind, or just agree to the previously stated opinions. This doesn’t mean that discussing problems in groups is bad, but it’s important to give participants individual time to come up with ideas beforehand. This is where brainwriting comes in. 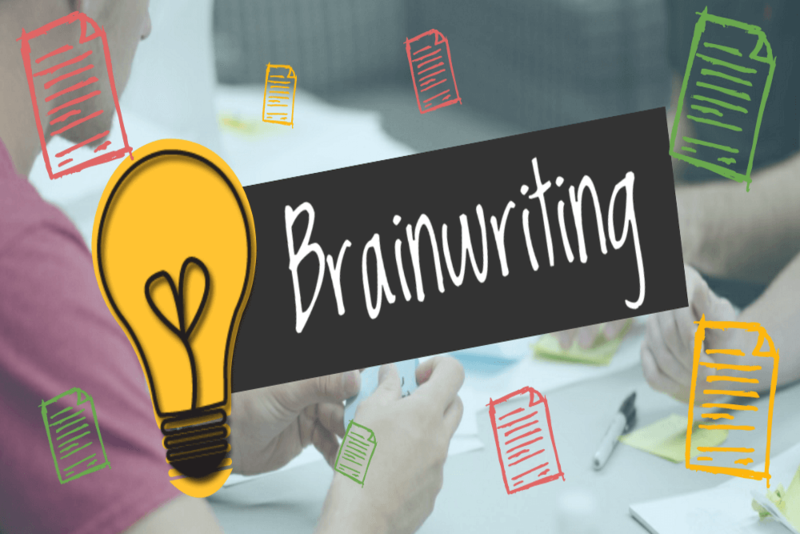 Teams can use brainwriting as an alternative or complement to brainstorming. The advantage of brainwriting over brainstorming is that ideas are generated simultaneously and in written form, thus, you don’t run into the problem of having one idea or person dominating the process. Every idea is written down first, and only after all ideas are collected does the group discussion begin. Another advantage of brainwriting is that you can use the methods for generating ideas in large groups. Brainstorming on the other hand is only effective for smaller groups. There are many ways to conduct a brainwriting exercise. There’s the 6-3-5 method, where 6 participants have to come up with 3 ideas/solutions in 5 minutes. You can have individual sessions, where everyone exclusively works on their own ideas. Or you can hold interactive sessions, where everyone writes down their ideas on a sheet of paper and then passes that sheet to another participant who can add their own ideas. This is the method that we will explain below. The biggest problem of introducing a new technique or method is that participants often don’t understand its principle. While brainwriting might sound simple enough, you still need to explain the process of the exercise and its benefits to the team. The team also needs to understand the problem they have to solve. Having a defined objective will help them focus on coming up with the right ideas. Fuzzy goals are extremely detrimental to effective problem solving as the team might come up with a lot of solutions and ideas, but none of those will help solve the problem. You can use normal paper or post-its for the exercise, or alternatively even make use of digital tools. The benefit of using paper is that participants have something tangible to share, this will help with team building. After the preparations are done, the team can start brainwriting. A 3-5 minute time limit for the first round should be sufficient for the participants to come up with ideas. After the first round ends, every participant passes the paper with their ideas to another person. Now the second round begins, this round and the following rounds can be shorter. Again, every participant adds their new ideas to the paper with the ideas of their predecessor. This process is repeated until the fifth or sixth round. Collect all papers and present them on a board or spread them out on the table. Now it’s time to assess and discuss the ideas. Brainwriting usually generates more ideas than brainstorming, so it’s important to sort all ideas into groups and categories to get a better overview. Ideas should be assessed by their feasibility and whether they contribute to reaching the objectives defined in step 2, and whether they add value to the organization. Idea Generation: Brainwriting is the New Brainstorming [Infographic] - InLoox • Copyright 1999-2019 © InLoox, Inc. All rights reserved.